Burrito's Stable | -Oh No He Isn't! Read here the tale of a young Welsh artist who survived WW1, though he was brutalised by it. In two days time we shall be marking the moment in 1918 when the terrible fighting that cost the lives of millions in World War 1 came to an end. 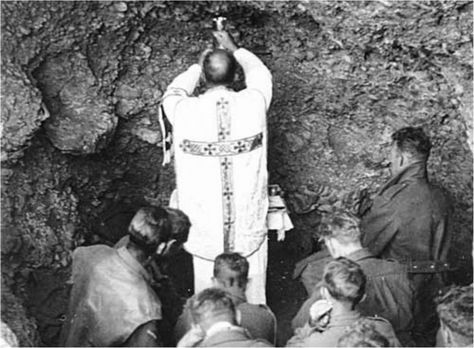 Amidst the most unimaginable suffering of trench warfare during WW1 men clung to their faith in God through the help of outstanding Catholic chaplains on both sides of the conflict. They gave heroic witness as they risked their own safety to bring comfort and the sacraments to the men of their afflicted regiments… and even beyond. As I write this, it is 0330 GMT. I have just returned home from Israel after a 13 hour journey by coach, aeroplane, and coach. I am completely ‘wabbit’ (pronounced ‘wabbered’) which is Glasgow slang for exhausted. Nevertheless, my mind is fizzin’ with wondrous recollections about what I have experienced over the last nine days. This ultra brief post is to explain why there has been so little posted on this blog of late. Since announcing my retirement from the NHS on September 11th, and following through with my letter of resignation and pension claim, I have just been very busy tying up loose ends and also dreaming hopefully of the future. I wish to retain my licence to practise medicine in the UK so I have had a few more hoops to jump through. The clinical work has also been heavy of late. After three months as a surgical houseman (FY1) for the ENT firm, I entered a completely novel environment, for me. My new boss was Mr Higgs, a general surgeon who also did urology. He was a superb surgeon: fast, decisive, and highly skilled. Here is a video that portrays him somewhat: Mr Higgs was a Sir Lancelot Spratt sort of surgeon but a bit shorter and wearing tweeds and with a redder face. I am the hapless fellow who gives the wrong answer at the end (as portrayed by Dirk Bogarde). Mr Higgs’ secretary was called Betty, and she remains the most nervous person I have ever met. Even at peace, her voice quivered, but in the presence of her master it quivered even to the max. Despite this nervous disposition, she adored Mr Higgs, whom she referred to titteringly as ‘H’. He refused to use new-fangled things like Dictaphones and so Betty had to follow him around everywhere and take down his every utterance in shorthand, to be typed up later. In work he was a monster to be obeyed slavishly, but socially he was a genteel giant. When leisure permitted, he would take his junior staff off in his huge Jag’ to some expensive country eaterie and treat them to a slap-up feed and drinks galore. He had a generous soul. He took a shine to me, perhaps because I was a bit of a hopeless case. My professional inadequacies were merely sighed at rather than bawled at. Sadly I caused him great distress on at least one occasion. The patient required a LEFT orchidopexy. He had an undescended testicle that needed to be put into his scrotum before it became cancerous. Unfortunately, I consented him for a RIGHT orchidopexy because I was a completely incompetent doofus. He stopped immediately and examined the patient’s scrotum. Indeed, the testicle in question was in the other groin. He then glowered at me with such ferocity that I wonder how I am still alive today. After a few seconds consideration, Mr Higgs continued with the operation. Instead of opening the other groin, he managed to perform the correct operation successfully through the already open incision. Please don’t ask me how, I am only an anaesthetist..
As he delivered the last skin suture, he looked at me wearily and said: “I leave it to you to explain everything to the patient”. What I had done, consenting a patient for surgery on the wrong side, would nowadays be termed a “Never Event”, the worst of medical sins. Fortunately, consent is now only taken from the patient by the surgeon who actually will perform the procedure, thus minimising the risk. When I checked up on the patient the following day, he understandably wanted to know why his scar was on the wrong side. With a lying wink, I told him that Mr Higgs liked to show off his surgical prowess occasionally. The patient, a young man, happily bought my explanation and went home, perhaps to dine out on the story for ages after. This clip really needs no explanation. I recently had to raise my voice obnoxiously to quell the silly chatter in theatre at a critical moment. Better discipline would prevent this happening again. There is a discipline practised by those who fly aircraft, that I believe deserves to be more widely implemented, especially in critical care environments and perhaps throughout the NHS . It is called “SILENT COCKPIT!”. In an aviation environment, the saying of these words by ANY crew member signals that all chatter and distraction must cease immediately and everybody’s, attention must focus on the job in hand, for life is at great risk. One of the great pleasures of working in a hospital environment is the great camaraderie enjoyed by all. There is great craic to be shared by those fighting a good fight together. The armed forces surely experience a similar thing. Sometimes however, reality violently subverts the dolce vita. A sure sign you are getting older is how much time you spend reminiscing. “Nostalgia ain’t what it used to be”, is an old quote, often rejoindered by “but then it never was”. I first found myself humming and singing to myself tunes I used to love as a teen and tween just the other week. The tune that stayed with me the longest was “Poor Boy” by Supertramp, from their album “Crisis? What Crisis? (1975). Than just to sit here and talk with you. As long as I can feel free. One drop of rain, they complain, it’s the same about the wage they’re earning. We have appearances we must keep up”. Enough to get by, suits me fine, I don’t care if they think I’m funny. You will be right here with me, all the way. These guys never wing it, especially if they are after your sandwich or bag of chips. I refuse to belong to either the right or left wings of politics or anything else. For stable flight, both wings are needed, and any aeronaut, or seagull, will tell you that. The job of politicians is to serve all those human beings who have placed all their trust in them. It is not their job to pursue some ideological crusade vicariously. SERVICE is their one and only job. This post is no political manifesto. It is a simple statement of the principles which must underlie all matters pertaining to the running of a community, whether that be a neighbourhood, parish, town, county, or nation. Once upon a time, everyone was a cave-person. Life was certainly more simple then. There were no mortgages, income tax, or bills to pay. Everyday life was almost fully consumed with providing the essentials of life for the very next day, and no further. Food, water, shelter, and care for children-the vectors of the race’s future were the only priorities. Medical care was very primitive, and life expectancy was rarely beyond the age of 40. Compared with today’s modern cushy lifestyles, it was a bit grim, but it was all they had. Amazingly enough, it must have been a successful way of life, because we are all here today as a testament to our forebears in the caves. Wrong image: not forebears, not four bears, only two bears, duh! “So how were all these people governed?” I hear the managers and politicians of today asking, in fear for their jobs. The simple answer is that they governed one another in a dynamically changing fashion. On Tuesday the tribe were all short of food, so the jocks would set out and bring home some mammoth for the bbq. On Wednesday, everyone fell ill and the natural healers amongst the tribe would sally forth and do what they could. –but that’s enough about them! I can picture the tribe falling about laughing at the witticism. In the background were the artistic sorts of cave-people who were busy besmirching the walls of the cave with natural pigments, for in those days, there was nothing unnatural, except laughter. They were trying to depict the rapidly evolving scene but probably failed to keep up. They could always manage a few still shots depicting this dramatic hunt or that, which would satisfy the jocks and everyone else. At the end of the recreations, everyone would retire to their beds to sleep, except those who would tend the fire at the mouth of the cave which kept all the hostile beasties at bay. And then there was evening and then there was morning, and the cycle resumed again. Oh dear, I appear to have started another thread of thought, which must be continued eventually. Alas, in my dotage, I seem better equipped for wool-gathering than spinning and weaving. Please pray for me, Thank you. This morning, in a moment of leisure, and under no external pressure, I firmly decided that I must retire from the NHS, ASAP. I decided to irrevocably change my world and that of all who depend on me, in a flash. The whys in detail will follow, but uppermost are my regrets: I will most sorely miss the pointless yearly appraisals, and the five-yearly revalidations where the State decides whether I am fit to practise as a doctor or not, above the opinions of my patients. I will also miss trying to practise artfully in a cash starved workplace that has been mismanaged almost to the level of one of those rich corpses that float in liquid nitrogen at great expense as they await some future cure. In no way am I fleeing from all the wonderful and beautiful people I work with, for that would be betrayal pure and simple. Besides, some of them will care for me eventually, when I succumb to nature’s processes, and then I will surely rely on their goodwill. Simply put, I wish to retire at the top of my game. A bit early perhaps, but we can survive financially. I look forward to spending more time with Mrs Burrito and our beloved son. Two large Guinnesses please, barman! A Fiery Debate About Agreeableness Etc.